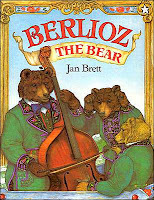 We just read Berlioz the Bear, by one of our favorite author-illustrators, Jan Brett. In addition to the charming pictures, the story has a fun, predictable pattern: one after another, several animals take turns trying to help Berlioz's bandwagon get on its way to a "gala ball". After they all fail, a mysterious character emerges from the double bass to save the day...and make my kids burst into giggles. Even if a certain classical tune doesn't pop into your head when you read this book, the last page gives a clever nod to Rimsky-Korsakov's "Flight of the Bumblebee". Let your kids dance wildly to the music, or show them an orchestra playing it impressively at a concert.